Open data enables citizens and communities around the world to engage in important societal and environmental issues. Besides stimulating innovation, entrepreneurship and scientific discovery, open data democratizes decision making processes by increasing transparency. It enables citizens to comprehend actions of their leaders and to hold them accountable when the information doesn’t add up. But simply making data ‘open,’ or freely available to everyone, doesn’t guarantee accountability. In order to make data actionable for the average user, it needs to be put into context and packaged into the right tools. Global Forest Watch (GFW), one of the go-to platforms for the most up-to-date forest information, aims to turn big data into action. On the platform, users can perform a number of complex analyses with a few simple clicks. Our data and powerful feature allows anyone in the world with internet access to monitor deforestation globally in near-real time, calculate carbon emissions from land conversion or even evaluate the impact of companies’ supply chains on forests to measure their progress toward zero-deforestation commitments. National forest agencies in the Congo Basin have leveraged the GFW platform perhaps better than anyone to help them protect the vast riches of their environment. The Congo Basin is home to some of the largest undisturbed tropical rainforest on the planet with thousands of tropical plant species and hundreds of endangered mammals. Approximately 75 million people live in the Congo basin, many of whom directly depend on resources provided by forests such as food, water, fuel wood and income. The Congo Basin Forest Atlases, first released in 2005, were created in partnership between World Resources Institute and the forest ministries of Cameroon, Central African Republic, Congo, Democratic Republic of Congo, Equatorial Guinea and Gabon. These Atlases were made using data and analysis featured on GFW, customized to include local data and fit the needs of the ministries responsible for managing their national forest estates. They contain information on land allocation, management practices, and logging statistics as well as a collection of official documents such as decrees, by-laws and management plans. Prior to the Forest Atlases, this information was scattered across various departments and agencies and often inaccessible for officers in charge of making land use decisions, resulting in double allocation of land, insufficient assessment of cases or conflicts of authority. Making it all available through the Forest Atlas helped the ministries to streamline their internal processes to avoid mistakes, and to implement and better communicate their sectoral programs. The Atlases also opened access to national forest data to the broader public. For the first time, forest stakeholders were able to validate the information they got from the ministries and draw their own conclusion. All of a sudden, maps and spatial statistics on forest and land use found their way into reports and publications across the entire community of forest stakeholders, including national agencies, development organizations, national and international NGOs and private companies. 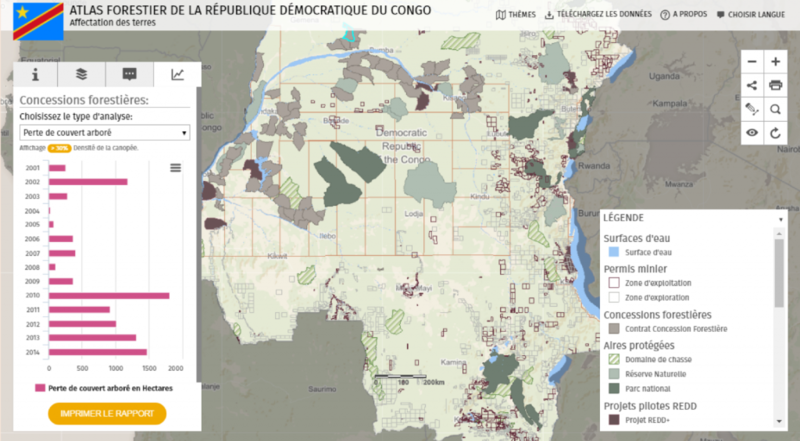 The Atlases have made tangible improvements in the management of Congo Basin forests. For example, Cameroon’s Ministry of Forestry and Wildlife (MINFOF) used their Forest Atlas to pinpoint potential illegal logging activity by overlaying maps of logging roads with logging and mining permit boundaries to reveal activity that extended beyond what was legally permitted. The Democratic Republic of Congo’s Ministry of Environment and Sustainable Development used their Forest Atlas to evaluate forest concession contracts for renewal, and ultimately suspended 91 permits covering 12.7 million hectares (31.4 million acres) for violating legal requirements. MINFOF has also established a community and council forest in central Cameroon (see it here), based on forest loss detected using data and recommendations from GFW. The Forest Atlases contain some key features that have improved forest management in the Congo Basin. GIS tools to help decision-makers work with maps which highlight different aspects of forest and land use management including logging, mining, agriculture and conservation. With one click, users can run complex analyses on land cover composition and above ground biomass as well as forest cover dynamics such as forest cover loss and gain and bushfires. 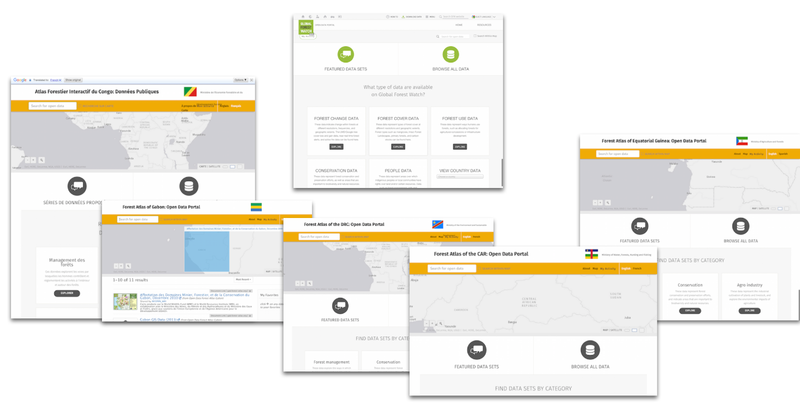 Near real-time forest cover monitoring systems such as weekly GLAD and monthly Terra-i alerts are available via Global Forest Watch’s Open Data Site. Users can browse through the attributes of every feature on the map to learn more about what it represents. For example, for conservation areas, logging or mining permits user can learn when and how these areas were created and how and by whom they are managed. If available, users can also download relevant documents such as management plans, decrees or by-laws in PDF format for the different features. In addition to the web-map tools, the Atlases enable the public to access more forest sector information. Each Atlas has a corresponding Open Data Site where anyone can find and download data they see on the platform. The data is maintained in both English and French, the official language spoken in most Congo Basin countries. Since data are published directly by each government agency, they are considered an authoritative source. Towards the end of 2016 an additional module providing in-depth analysis for key indicators for the forest sector will be release for the different atlases. If you would like to learn about the technical details, you can read more about how the Forest Atlas was engineering and built using open data and open source. Article contributed by Thomas Maschler and Asa Strong from World Resources Institute. Thomas is a GIS Associate for the Food, Forest and Water Program. He leads the GIS, remote sensing, database and web site components of its forest initiative work in Central Africa. Asa is a GIS Research Assistant for Global Forest Watch (GFW) within the Food, Forests, and Water Program. Asa is involved in acquiring and preparing geographic data for the GFW platform, and improving the efficiency of data management across the GFW platform.